Tribes Come Together to Challenge the Indian Child Welfare Decision at the Indian Country Today website. Tribes Offer Overwhelming Support for the Indian Child Welfare Act at the Navajo-Hopi Observer. Attorney General Ferguson Urges Appeals Court to Preserve Indian Child Welfare Act news release at the Washington State Office of the Attorney General website. Alaska Official Call on Court to Uphold Indian Child Welfare Act at the KTOO Public Media website. 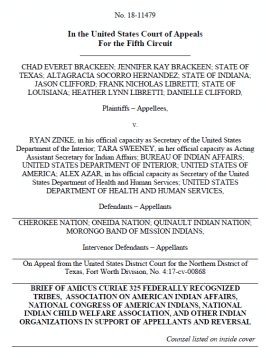 Lawmakers File Bipartisan, Bicameral Amicus Brief in Support of the Indian Child Welfare Act at the Office of Tom Cole (R-Okla) website. AG Brnovich Joins Bipartisan Coalition in Defense of Law that Protects Native American Children at the Arizona Attorney General website. Alaska Fights Ruling on Native Adoption Law at the Bristol Bay Times website. This entry was posted in Court Cases, News and tagged Fifth Circuit, Texas. Bookmark the permalink.